Using Styrofoam as a form is great! Have you, like me, admired the naturalistic look of mosses and succulents growing out of rocks in an alpine garden? There’s something magical about the way the plants find their roots in the cool, chalky spaces inside the rocks. The plants themselves look so appealing in their architectural growth patterns. 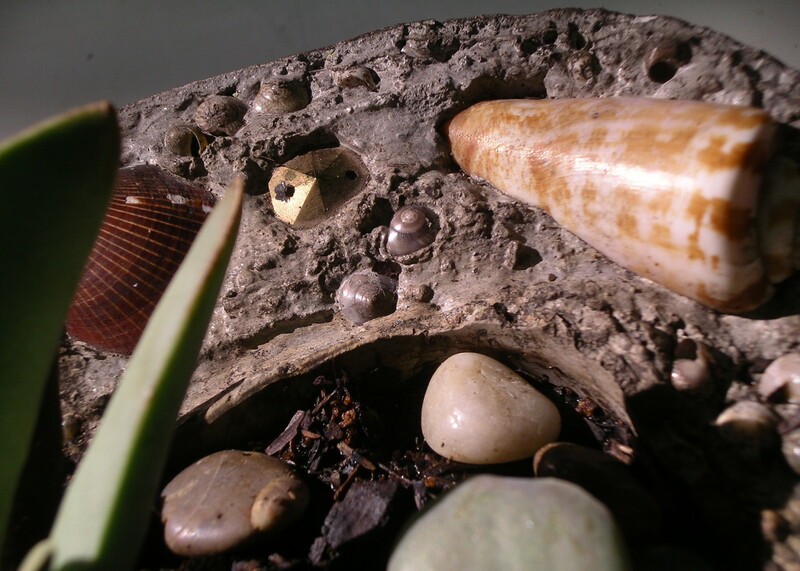 So I decided to learn how to craft these rocky dwellings in my backyard, using items from the dollar store and even plastic trash that gets thrown away (or at our house, recycled). Hopefully you’ll find this activity fun and relaxing – and immediately rewarding. Portland Cement – this comes in a large bag, and it’s very heavy. You might want to enlist the help of a nice weightlifter to get this baby home. Note: Do Not buy anything that says it’s premixed concrete. You want pure cement. 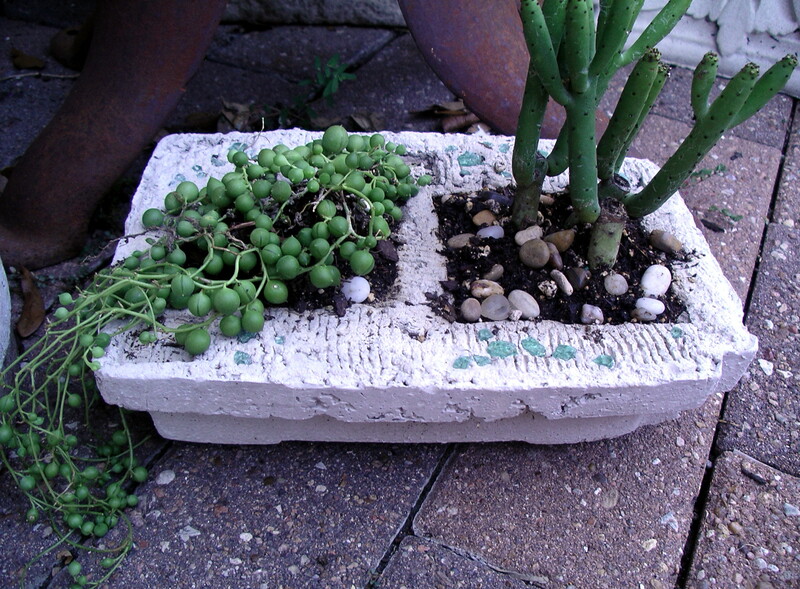 Perlite – those little white pellets made of styrofoam that are used to aerate the soil. Buckets – I use two; one for mixing and one for holding a ready supply of dry cement since the bag resists moving. Forms – this is where you will go to the dollar store and start scoping out the various bowls and storage containers. Try out one form inside the other. TIP: Always allow more than a half inch for the walls of your vessel. IOW, if your outside bowl is 10″, your inside bowl will need to be at least 9″ or less. If you try to make them look like they are nesting, the walls will end up too thin and will crack, if you manage to get the vessal loose from the forms at all. Now, think about all the neat forms that veggies and fruits arrive at the grocery store packed in. There are small square boxes for strawberries, blueberries, and tiny tomatose. These can even be very decorative. I love using the fluted round box that my grape tomatoes arrive in. So cool! For the interior, think about water bottles, small juice bottles or boxes, and the like. The easiest to work with are really the cardboard packages, and plastics should be straight sided (Imagine trying to remove an interior with groves… it can be done but can be difficult and even dangerous. Cutting your fingers on rough plastic is super gnarly!). Don’t even try to use glass on ANY of these – not as interior nor exterior. Trust me, it just doesn’t work. Now we’ve got our stuff and a few forms with an idea of how we’re going to set them up. All we need are some plugs to create the hole in the base of our hypertuffa pot, if it’s going to do duty as a planter. These can be cut from plastic or rubber tubing. You can buy this by the foot at any hardware store and then snip it into .75″ pieces that will be placed vertically at the bottom of the outside form. You will see what I mean when you make the first one. Next I’ll discuss mixing the tuffa and pouring the mixture. Following that, we’ll remove the interior form and eventually the exterior form, do a lot of cleaning up and routing out the bottom hole. Then we’ll plant our new creation after it fully hardens (about two weeks). Voila!